Detection of HIV proviral DNA on Toothbrushes: a preliminary study. In 1986, Glass and Lare published the results of a systematic study concerning microorganisms found on the toothbrushes of "healthy" dental patients; patients with inflammatory disease; and as controls, new toothbrushes taken directly from their packages1. (3) four out of five (80%) of the toothbrushes from one manufacturer were contaminated in the package. These findings were confirmed by Kozai et al who examined toothbrushes from 150 children and found large quantities of microorganisms were present even thorough rinsing and 24 hours of drying2. Subsequent investigation by Glass and Jensen were performed to delineate the problems of the toothbrushes further or to identify methods and/or technique3. They inoculated known quantities of Herpes Simplex Virus, Type 1 (HSV-1) onto sterile numbers of infections viruses (as determined by cytopathic effect on tissue culture cells) could be retrieved after 48 hours from artificially dried toothbrushes (HSV-1 is usually killed by drying). When toothbrushes were maintained in a moist environment (similar to that of a bathroom), approximately 50% of the original number of virus could be retrieved after seven days. Vital staining of the microorganisms revealed the majority of viruses adhered to defects in the bristles (both shaft and ends) and the cores of natural bristles toothbrushes. These positions of adhered often were associated wit proximate jagged bristles edges. Thus, two of the necessary criteria for transmission of disease were met: (1) presence of viable microorganisms and (2) a potential portal of entry. Can HIV proviral DNA be isolated from the toothbrushes of known HIV positive patients? This exploitative study was designed to be a single blind study. It was projected to include at least six HIV positive subjects as study cases and two HIV negative subjects as controls. 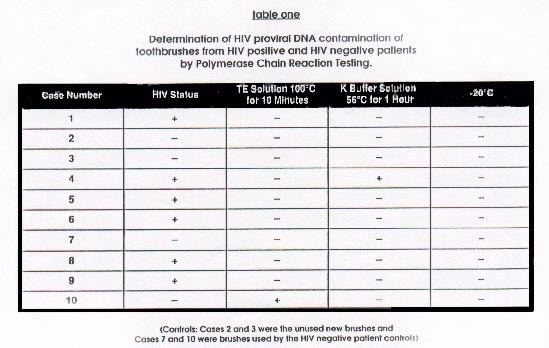 The toothbrushes used daily by the subjects were obtained for further analysis for contaminated with HIV proviral DNA. In addition, a second control group was comprised of two toothbrushes that were never used by a patient. Therefore, then study was comprised of ten toothbrushes: six from HIV positive patients, two from non-infected individuals, and two new toothbrushes. All patients were asked to bring their toothbrush to a dental examination. Informed consent was obtained, a screening examination performed, and significant data (i.e. toothbrush environment, oral health status, etc.) collected. A control patient was considered "clinically healthy" if, following clinical examination by the principal investigator, they were found to be caries free and were not found to have mucosa disease not gingival/periodontal inflammatory disease. When the patients arrived with their toothbrushes, sterile technique was used to remove a bundle of bristles. The bristle were then placed in a sterile glass tube with a lid and stored at -60?. Following collections of all samples, the tubes were packed in dry ice and shipped to the University of Louisville where they were tested using three different polymerase chain reaction (PCR) techniques for presence of HIV proviral DNA22. The sequence of the HIV PCR primers (JA17-JA20) were followed according to the techniques reported by Albert and Fenyo23. The primers were synthesized using an Applied Biosystems 391 EP synthesizer and purified over Sephadex G-25 columns. A nested PCR was utilized (In nested PCR, the target DNA was amplified with a specific primer set. Ten percent of this first reaction was used as template for a second PCR containing a set of specific primers JA 17 and JA 20. Ten percent of that reaction was then used template in a PCR using primers JA18 and JA19. The final reactions were then resolved on a 2% agarose TAE gel containing ethidium bromide that binds DNA and can be visualized under UV illumination. An amplification reaction was considered positive if a 111 basepair DNA amplification products were detected. A Perkin-Elmer Cetus 9600 GeneAmp PCR system thermal cycle was used to incubate the samples. Both reactions of a nested PCR were amplified for 30 cycles each. Each cycle for both reactions consisted of a 30 second denaturation step at 94?, followed by a 30 second annealing step at 41?, and finally a 30 second extension step at 72?. In each PCR test group, DNA from an HIV positive individual was used as a positive control, while placental DNA was used as a negative control. In the first round of tests, 10 ul from each template treatment (TE and K buffer) from each sample was used as a separate template in a nested HIV PCR. In the next set of tests, each K buffer treated sample was concentrated by vacuum centrifugation and the entire sample was used in PCR. Although this increased the amount of DNA added to the reaction , it also increased the salt concentration. One-third of the bristles from each sample were incubated with 200 microliters of TE (10mM Tris-HCI, 1mM EDTA, pH 8.0) at 100? for ten minutes. Another one-third of the bristles were incubated with 200 microliters of K buffer (50mM KCI, 10mM Tris-HCI, 2.5mM Magnessium Chloride, pH 8.3 with 0.5% Tween 20 and 100ug/ml Proteinase K) for one hour at 56? followed by ten minute 100? incubation to inactive the protease. The remaining bristle were stored at -20?. Finally, the remaining untreated bristles were cut into small pieces and treated with 50ul of K buffer. 10ul of each sample of this preparation was used for PCR amplification. Single blind study of toothbrushes using PCR techniques was performed on HIV positive patients, normal subjects and new toothbrushes. The HIV positive subjects were male with an age range of 31-39 years of age (average age= 33.6 years). The HIV negative toothbrushing controls consisted of a male (age, 35 years) and one female (age, 42 years). Four of the HIV positive patients demonstrated mucosal inflammatory disease; one of HIV positive patients had periodontal disease; and two of the HIV positive patients had caries. The control met the criteria of not having any active dental diseases. The results of the PCR analysis of toothbrushes using three separate techniques are summarized in Table 1. Using the TE solution at 100? for ten min. method, only case #10 (a toothbrush from a "clinically healthy", HIV negative subject) was found positive for HIV proviral DNA. Using the K buffered solution, case #10 was negative, but case #4 (a toothbrush from an HIV positive subject with active periodontal disease) was positive for HIV proviral DNA. None of the bristles which had been stored (dried) at -20? were PCR positive for HIV proviral DNA. Although the intent of this study addressed the question of transmission of HIV proviral DNA via the toothbrush, the issue of detection of HIV proviral DNA on the toothbrush and the use of PCR testing was fundamental to this point exploratory project. PCR testing is a extremely sensitive procedure and can be affected by the slightest contaminated, which can impact the potential value of PCR testing as a screening tool. Although the results of this project are based upon a small sample size, the concerned of false positive and/or negative arise. There were three phases or tests in the PCR programming, namely the TE solution, the K buffer solution, and the 20? or drying phase. The TE phases demonstrated 6 false negative and 1 false positive; the K buffer solution also demonstrated 5 false negatives, but did not identify any false positives; and the -20? demonstrated 6 false negatives and no false positives. It would appear from the results of the limited sample in this study that the high level of false negatives would adversely the interpretation of the role of the toothbrush in the transmission of HIV proviral DNA. The issue then emerges as to whether PCR testing is sensitive enough or too sensitive to identify HIV proviral DNA on the toothbrush. While one toothbrush from an HIV positive patient patients was found positive for HIV proviral DNA, five toothbrushes from HIV positive patients were found negative for HIV proviral DNA. Several possible explanations for this finding seem reasonable: (1) HIV proviral DNA was not shed by the HIV positive patient at the time of the study; (2) HIV proviral DNA was being destroyed by the saliva; or (3) HIV proviral DNA was being destroyed consistently retained on the toothbrushes. Based upon pervious investigation by the author, the contamination and disease transmission by the toothbrush have been clearly demonstrated. Therefore, the issue highlighted by this study emphasizes the need for education concerned toothbrush care for AIDS patients and their families. This need has been brought to the forefront by the recent high media coverage regarding transmission of the virus to family members through an unknown vector.13,14. As pointed out in the Editorials of the same issue of the New England Journal of Medicine [Ref.13], an important component in a protocol for the home environment of an HIV positive individual must be elimination and control of all potential vector of HIV proviral DNA transmission 24. Since toothbrush contamination and disease transmission has already been demonstrated, good toothbrush care must be a part of any preventive program1,3,4. Good toothbrush care would include a new toothbrush every two weeks; storage of the toothbrush in a dry environment outside the bathroom; and the most obvious, not sharing toothbrushes 25,26. The toothbrush method of HIV proviral DNA detection needs further investigation. This will allow determinations to whether the HIV proviral DNA from the toothbrush can be infectious. Also, in a constant search for techniques for the early detection of HIV, the contaminated toothbrush may play an important role if it can be found that the toothbrush is positive during the "window period" of HIV infection. PCR testing for HIV proviral DNA on the toothbrush is in the developmental stage. This may explain the inconsistencies of the results obtained in this study. Further investigation is needed to refine the procedures used to detect the presence of HIV proviral DNA from the toothbrushes from HIV positive patients is needed to evaluate the sensitivity of PCR testing relative to limiting the percentage of false negatives. Based upon previous data, the potential for transmission for the HIV proviral DNA via toothbrush is a viable consideration in controlling infection. The role of PCR testing as a screening procedure may not yield satisfactory sensitivity or specificity levels, but this does not, and should not, rule out the potential for transmission of HIV proviral DNA via this substantiated disease transmission vector. As part and parcel of any home regimen associated with the control of reinfection or transmission of HIV, appropriate attention, must be directed at maintaining good toothbrush hygiene.